How to be financially creative with homeschool curricula. It’s quite the title isn’t it? What does that even mean? How to be financially creative with homeschool curricula is the skill we are going to talk about today. And it is a skill, don’t let anyone tell you differently! So what is it exactly? 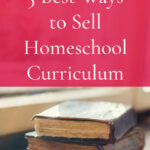 It is the skill of saving money on homeschool curricula. 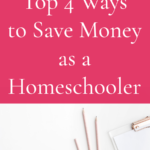 Learning how to be financially creative with homeschool curricula is going to give us the option to find the best resources, but not spend nearly as much money as you easily could. How exactly can you be financially creative? Aren’t numbers kind of absolute? 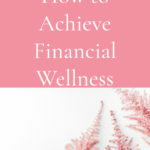 When you are practicing financial creativity you are making decisions about how best to use your money. So financial creativity with regards to homeschooling is going to mean figuring out where to save and where to splurge. We all want the best resources for our children and our homeschool. However, most of the time we have to look for ways to work around the high costs of curricula. That is where financial creativity comes in. What is the first step to being financially creative with homeschool curricula? It is planning. You need to know exactly what your children need for homeschool to be able to make the best financial decisions. Of course, there is a big learning curve when it comes to finding out what the appropriate curriculum for any given subject is for you and your family. This post is not going to spend a great deal of time on planning, but just know that this is going to be a place we will have to park ourselves for a while. When we plan well, we are able to be financially creative with our homeschool curricula. Why? Because you know exactly what you need, and are able to search it out. Look for the best deals, and generally, know that the choices you are making are the right ones for your student. Does all the extra planning mean that you won’t make a mistake? Or that you won’t need to change course half-way through the year? Unfortunately no, but as you continue year by year, you will learn your child’s learning style, and your own teaching style and these things will become clearer. There is one thing that homeschoolers all hate, and that is making the wrong choice when it comes to the choices we make in our homeschool. If we are financially creative with homeschool curricula, it gives us a little more breathing room if we do have to make those changes. As homeschoolers, we have so many choices as to how to bring learning to our children. There are more homeschool philosophies than any one person could ever really know. So how do you make the choices to begin with? You need to make sure that you are talking to your kids, and know what they are interested in, and you have to know what the best way that they learn is. Some kids learn really well through reading books. Other kids will need a lot more hands-on learning. Some do great with computers, others need a pencil and paper to make the math work in their brains. None of these choices are wrong. In fact, they can all be used for the same child! Learning where to be financially creative with homeschool curricula is going to depend on the choices you make for your individual family. If your family places a high value on books – perhaps you will spend a little more on books up front, but won’t buy as many supplies for science experiments. Or because books are so important to you, you will spend a lot of time in the library checking out the books, and putting your money towards the science experiment supplies instead. How much did you spend this year? Now that we have talked a little bit about planning and choices, I want you to go back and add up how much money you spent on homeschool curricula this year for your kids. Was it a lot? Did you skrimp and save? Were you already financially creative with homeschool curricula? Most likely you were. Most likely you were looking at ways to save in every subject. You wanted to combine subjects so that you could save money. You wanted your children to be in the same area of learning so you could save money. Now that you have that number for each of your kids, were there some missteps? Were there areas that you scrimped on because you felt you needed to, but it ended up being a disservice to your child because they didn’t have the right tools available? This is something we are constantly battling in our home. Making sure our kids have the right tools to do what they need to do. I will give you an example. A couple years ago we bought the kids these Dell laptops on sale. They were a great deal, and the kids needed something for all of their online learning (teaching textbooks, khan academy, every coding class we could find). I figured that these would be perfect. They didn’t need a lot of storage because they were mainly for online use. I thought I was being financially creative with homeschool curricula by purchasing these inexpensive laptops. What ended up happening? They ran out of memory too quickly, and can really only be used for online endeavors. I was looking for an inexpensive quick fix but probably would have been better off waiting and saving up for something better, that they could share. Where to save and where to splurge is going to be an individual choice. I cannot tell you exactly what you should spend your money on because I don’t know your children well enough, or your financial situation well enough. You are going to have to make that decision for yourself. Being financially creative with homeschool curricula does not have to be a hardship. It doesn’t have to be a struggle, but it does have to be examined and you do need to make sure that you are saving and splurging in the right places. Your first step will be making a line item in your budget for your homeschool. We have talked a little bit about budgeting, and the importance of budgeting. Now is where it comes in. You need to have a line item in your budget for your homeschool. Take the amount that you spent this past year (that’s why I had you add everything up) and figure out if that is going to work again this year, or if you are going to need to increase the budget or decrease it. Do it now, don’t wait! If you are reading this when the post first comes out, it is mid-February. It isn’t quite time to be planning for next year, but we are getting close. If you decide on that amount now, you will be able to start a sinking fund for that line item. You will contribute a little bit each month until you plan on purchasing your curricula and supplies. Then you will have a place to pull the money from when it is time to purchase. 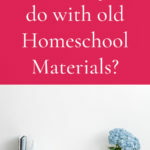 If you are reading this in the middle of the summer, and you are starting to gather your homeschool materials right now, I have some options for you as well. Regardless of the time of year, take that number, and figure out how much you can contribute each month to a sinking fund to get to that number you need. Let’s start with splurge, shall we? Being financially creative with homeschool curricula may not sound like a “splurge” mindset. But, it is! You are giving yourself permission to spend money on the things that are important to your family. If you know that your kids need a specific tool, or class, or book, or whatever it may be, making a plan ahead of time allows you to splurge. This is part of why budgeting doesn’t have to be a drag. A budget tells your money where to go, instead of not knowing where your money goes. Being financially creative with homeschool curricula allows you to save on the areas that may not be as important to your family, and splurge on the ones that are. There are a lot of homeschool families that find travel to be a very important part of their homeschool, so they look for ways to scrimp and save in other areas in order to put that money towards travel. Each family will have different priorities. When we talked about choices above, you thought about some of the areas that you place high value in. We place high value in books and learning technology, so that is where we spend a lot of our money. Where does your family place value? Think seriously about it. If you don’t feel like you can splurge on anything, that is absolutely OK. Sometimes the budget is so tight that you have to make sure that you take account of every dollar you are spending. Being financially creative with homeschool curricula is actually easier than you think, especially when it comes to inexpensive resources. The drawback to inexpensive resources is that you have to spend the asset that you do have – time. It is a trade off, money for time. If you don’t have enough money, you will have to spend the time. How do you save money on homeschool curricula? We have already talked about the time involved, but where are these less expensive resources? I wanted to give you some hope, and also take some of the time commitment for searching out resources that are less expensive. So here are many resources you can use to be financially creative with homeschool curricula. Full Homeschool Curriculum – pick and choose what you want! 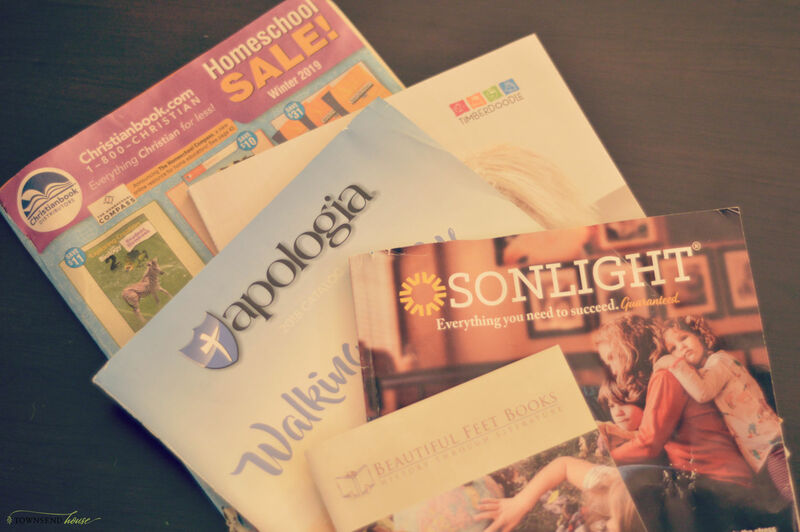 These are just some of the resources that we use in order to plan our homeschool year. There are so many free resources available online now, but don’t forget about your local library. If there is an area that your kids want to study, talk to the children’s librarian, or the main librarian. They are a wealth of knowledge and can often point you in the right direction. Free and inexpensive homeschool curricula choices aren’t the only place you can save money. Currently, I am compiling a list of discounts that homeschoolers can take advantage of. This is only for my wonderful community of subscribers though, so if you want to get this guide, please sign up below! If you are already a part of the Townsend House Community, you don’t need to sign up again – I will be emailing this out to you soon! Have you worked on your budget homework from last week?